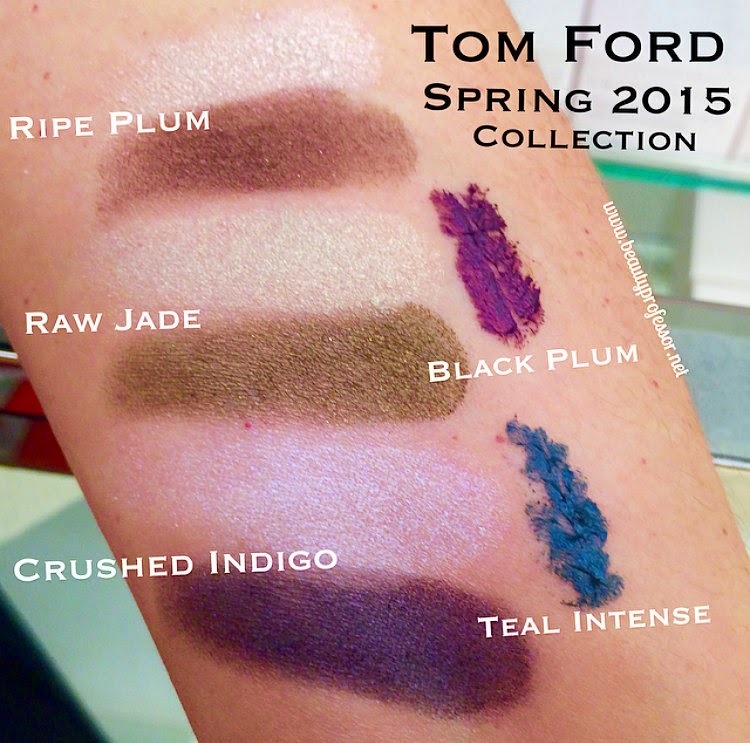 Above: The Tom Ford Beauty Spring 2015 Collection encapsulated into true-to-life swatches for your viewing pleasure! Hello lovely readers...I hope your week is going well thus far. I am excited to announce the arrival of the Tom Ford Beauty Spring Collection to the Neiman Marcus website. While some counters have received early limited supply of product, today marks the first sighting of collection, currently available for pre-order, just in time for the Neiman Marcus Beauty Event (running now through 3/1/15). Above: The collection at the Tom Ford counter. Eye Color Duo Bruised Plum...a brownish purple and creamy gold pairing with extreme versatility. This will be mine! Eye Color Duo Raw Jade...a khaki green and pale green-gold pairing for subtle adventure. Eye Color Duo Crushed Indigo...a deep blue-tinged purple and iridescent pink pairing for drama and smolder supreme. Extreme Mascara Teal Intense...this peacock green is vividly stunning. Extreme Mascara Black Plum...deep, vivid violet for a fresh twist on black. Finally, available this minute, the gorgeous Limited Edition Creme Color for Eyes. This blackish gray with a bit of khaki thrown in for good measure is soft and smoky while still being very wearable on the daily. This formula is longwearing and creaseless and I have no regrets about having picked up Platinum and Spice...now that they're gone, I wish I'd bought a back up of each. I will very likely feel the same way about this shade! Bottom Line: How apropos that the Tom Ford Beauty Spring Collection has arrived just in time for the Beauty Event GWP (details and full review HERE). I cannot wait to hear what has caught YOUR eye. If you'd like to call you order in, I suggest getting in touch with the marvelous Reena Levin (swatches above courtesy of her!) at Neiman Marcus Chicago (where most of the collection is already at the counter). Her direct contact number is: (312) 241-7189. Also, don't forget that today, 2/18, is the Space.NK Spring Beauty Edit one day only promotion for the gift bag...all details HERE. So much spring beauty goodness right now! Good things ahead, including my Omorovicza routine (with a special discount code for BP readers), a host of new product procurements and a haircare-centric post; I am also working on responding to all of your lovely emails and comments...thanks, as always, for your patience and support, especially during this crazy time. You can also get this at the Northbrook, IL Neiman's too. They carry the entire line. The TF consultant is Kimberlee Antonacci her direct line is 224-688-4883. I hope Jethro's surgery goes well and that his recovery is textbook perfect. I recently had to take one of mine in to remove an abscessed tooth, and they discovered she has a heart murmur which could be due to the infection or because of her age. Either way, it's concerning. I bought the new TF eye cream, and it's creasing rather badly on me. Love the look and color, but it's just not working well on my oily lids, even over primer. Any tips? It creases badly on me also and I have dry lids. I haven't tried it over primer, yet. It's such a pretty color but annoying that it creases! Thank you, Lulubelle! So far, so good. I hope your little one is doing OK now. I haven't had any creasing issues with the TF formula but I haven't yet tried this shade so I don't know if the issues could be shade-specific. At any rate, I love setting the cream shadow with a bit of powder shadow (like the NARS Dual-Intensity) for greater staying power. My eye got caught into the early 80's teal mascara goodness! I am not a wearer of purple shadows so I'll pass on the purple mascara. I've preordered the plum and the jade shadow. Received the Spring 2015 cream shadow last week. It is truly beautiful. That is excellent to hear...please let me know how you like the shadows! Thanks for your sweet words about Jethro...I truly appreciate your prayers. He is on the road to recovery and I am grateful, indeed. hope the surgery goes smoothly! I just had to go through a similar situation with my pup and it was terrifying (snake bite/ tore his neck open). Luckily he was ok and everything went smoothly and I wish the same for you and your husband! Now onto tom ford, haha the Jade and Indigo duos are insanely gorgeous! I've been really happy with the spring collections so far! Thank you ever so much. He is doing better and I cannot wait for the cone to come off. So glad to hear that you baby is doing OK now...what a scary experience! BP, I hope everything goes well with Jethro the little guy is adorable and you both are in my prayers. Hi Amanda...thank you so much. I appreciate your prayers...Jethro is on the mend! Praying for Jethro today and for you, too! Thank you so much, Jaimie. Praying everything goes well for Jethro today, he is such an adorable boy. I'm dealing with health issues with both my kitty and my dog so I know how heartbreaking it can be. Our furbabies are our everything!! Thank you for your prayers...he is such a blessing and it's been tough to see him in pain. I will keep your kitty and pup in my prayers. I've heard these duo's have some pigmentation issues based on standard TF quality so I'll be interested to see your take on them! Trying them soon, Clever Girl! Sending prayers for comfort, health, and successful surgery for Jethro-- and ease, love, and relief for you. I appreciate it, Alison...many thanks for the comforting words. I prayed for Jethro yesterday, and I'm hoping for a positive update today. 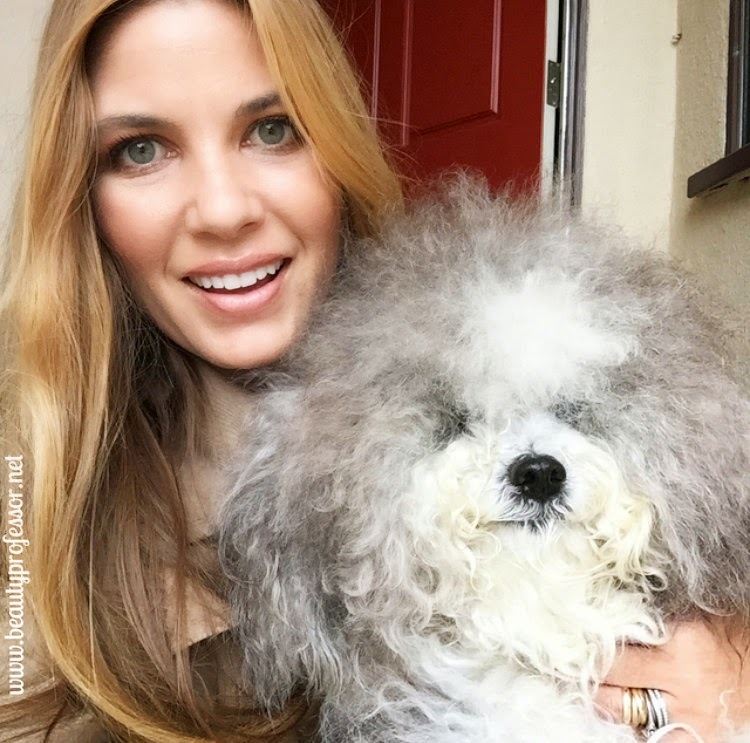 I've never commented here before, but I do appreciate your blog, Beauty Professor. I lived in Southern California for many years before moving to the east coast. I miss it. Sometimes when I see your outdoor photos, I tear up, but mostly I just smile. Thank you so much for your prayers. Jethro is definitely on the mend but it's a going to be a long two weeks of recovery! Thanks for taking the time to comment (and also for your kind compliment! )...it means a lot to me that you enjoy my blog. Sending some CA sunshine your way. Lots of healing vibes for Jethro and relief for his mama! Holding Jethro in my thoughts....please let us know how he is doing. Many thanks, Sunnykm...your prayers are much appreciated.